WSVN Sports Director Steve Shapiro. (Photo courtesy of Channel 7/WSVN). 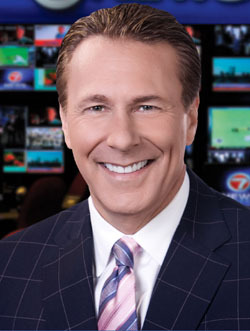 Unarguably the market's preeminent sportscaster, Steve Shapiro has been at the helm at WSVN (FOX/Channel 7) for the last eight years. He first joined the station as a sports reporter and anchor in 1997. A native of Boston, the meticulously attired, quick-witted Shapiro did his undergrad work at Tufts, then earned a master's degree from neighboring Boston University. He began his career in Roanoke, Va., in 1980, and has made stops along the way in Cincinnati, Albany, N.Y., and Hartford, Conn. Aside from injecting both humor and wit into his reports, Shapiro adds objectivity, which most of his brethren in the South Florida market simply are incapable of achieving because of their ties to the Miami Dolphins. You can catch Shapiro weekdays at 6:00 p.m., 6:30 p.m., 10 p.m., and 11 p.m., as well as on the lively, fast-paced "Lexus Sports Xtra" program, a 30-minute wrap-up show featuring über-agent Drew Rosenhaus and a bevy of local professional ballplayers in-studio, every Sunday at 11:30 p.m.
A: Get a college degree in broadcasting. While you're in college, do an internship at a television or radio station. Learn how to write for broadcast and make a professional résumé reel at the station. A: Survival. I've been in the television broadcast business for 31 years. Most people with whom I started are gone. A: Deadlines. I do four live sportcasts every day. We have to show up no matter what, without delay. Gotta be ready even you're not ready. A: Always wanted to be in sports. I played football and baseball. I knew I wasn't good enough to keep playing. Sportscasting is the next best thing. A: I always liked local sportscasters on the news more than national guys or play-by-play guys. They are the guys around the country who lasted because they were creative and good writers. One of them once told me, "Once you think you've got it made, that's when you get beat." A: I think being a trial lawyer would be exciting. That, or a Nazi hunter. A: Being in the know before everyone else, for sure. The other thing is getting to work at what I most like to do when I'm not working. Sports is my greatest form of entertainment. A: Late nights and no holidays. The news goes on 365 days. A: I don't live with regret. I've had some professional envy; people not as talented that were in the right place or [who] work for more employee-friendly companies. A: The Make-A-Wish Foundation is one. I donate mostly to the American Cancer Society.